I’ve not been writing. Not here or anywhere really. I feel rusty. My keyboard is creaky from months of neglect. We’re like the frozen Tin Man and his axe, me and my laptop, and this entry is that first bit of sacred oil. That first taste from a pitcher of minute-old lemonade. First off, we are all fine. Babe, me, the kids. We’re actually far better than fine. We soaked up a long hot summer on The Tenderfoot and we’ve enjoyed watching the leaves turn for us for the first time. Nature’s changes are glorious. I have many entries brewing in my head! Spring brought with it another bounty of adjustments, though, which has left me reeling still. I’m working full time again, on a team for a manager who has a manager and at the end of the chain there is a CEO. I sit at a desk, in a cubicle, under a white noise speaker. It’s such a foreign culture to me that it’s still a novelty. It’s different-ness will probably never wear off and I hope it doesn’t. I like it this way. The people are great, my manager likes my suggestions and I’ve been using a brainspace that had been deserted for years. It feels neat to have a new hat to wear. It’s good. The kids are doing better than I’d ever hoped at their new full time daycare. TLD and Belle love their friends and teachers. I love that I can peek in on their webcams and watch each of them sleep and eat and learn. TLD is learning yoga there, learning to share and take turns. Belle is forming friendships and finding her own little self in those hours away from me. It’s good. If I hadn’t have found their school this transition would have been agonizing. Because I found it, I’m happy to be at work and relieved to get a break from the realities of being Mommy to a preschooler and toddler. I am reclaiming myself and redefining myself and changing all at the same time. I’m not quite a billowey-sailed butterfly but I’m almost there and knowing the kids are in a good place during my new days has been critical. Thanks to the understanding nature of my new manager I leave work a little early once each week so I can still see a few my very favorite massage client friends. Sometimes my body reminds me that I’m working two jobs but there are so many rewards from this arrangement that I’m far more grateful than tired. And daycare is so damn expensive, I need to bring in as much as I can! It’s good. Let me be honest. Yes, I’m making lemonade out of some lemons here. I haven’t told the whole story. I loved being home with the kids, though I was beginning to feel that it was stifling to them socially. I wansn’t built like their new teachers were, chock-full of different character voices, ideas for rainy days and patience. 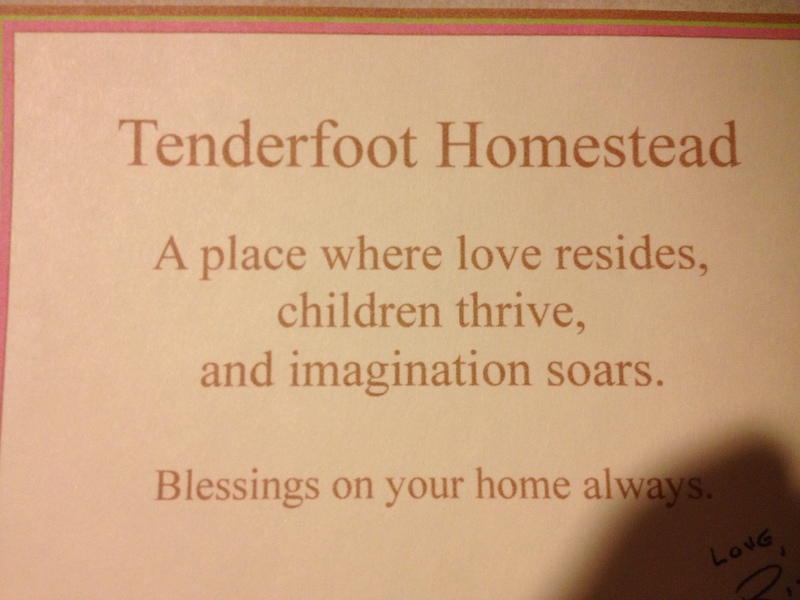 While the Tenderfoot is a great learning place, it lacks the social world that daycare offers. I also loved my massage business even though it was always stressful trying to balance the passion with the profit. I loved my days. Indeed I did. So what happened? I (and by extension, my family) relied a bit too much on someone outside of Team Tenderfoot. No! I’m doing it again. I’m taking responsibility for someone else’s faults. The truth is I trusted someone and they let us down, then betrayed and hurt me in all kinds of ways, and after all that happened I lost even more. Unfortunately I’m still discovering the depths of that person’s influence on me (and us). The changes on the outside- the job, the day care, the new routine-they’re nothing compared to the lopping off of that relationship that I had to do (for now anyway). So those are my lemons, vague as they are. And what about Babe? He’s the constant. He’s been supportive while not trying to FIX everything. He’s a good one, he is. He’s been exactly who I’ve needed him to be. There are times when I’ve wondered how peaceful for both of us it would have been had we partnered up with people a little more similar to ourselves. Same interests maybe, or at least the same taste for tomatoes? There is a lot of banter, a lot of compromise, a lot of challenging in a marriage of opposites.Through this though, I’ve seen just how little I need a twin and what a treasure it is to have him as my strongest ally. Babe, the support of great family and close friends, and a kickass therapist have made all the difference. So under this roof, sure things have changed since I last wrote a word, but this fresh lemonade is very very sweet and it’s nice to be back. Kind and true words a friend wrote for our housewarming. We keep this card in the kitchen, where we can see it every day. Lemonade can be tangy and harsh, but it sounds like you added just the right amount of sweet to make it not only palatable, but down right tasty. Keep on keepin’ on. Thoughtful and true. Thanks, Anna!